The Chinese Shar-Pei is another dog who looks like she got into the blueberry patch and spent the day eating her way out! The Chow Chow off-course is the other dog famous for its blue-black tongue. The Chinese Shar-Pei is an interesting dog. Not only is she interesting to look at, but she also has an interesting history: she was not officially recognized as a breed by the AKC until 1991. The suspicious Chinese Shar-Pei temperament can make her a bit snooty, as her hoity-toity name might suggest. Only her family will see the true side of a Shar-Pei. It’s their reward for giving her everything she wants and needs to survive. She pays much attention to people and animals she doesn't know, to the point of coming off as aloof sometimes. Some would call her “independent,” others would call her “stubborn.” One thing's for sure, she has a strong will. She's not the kind of dog to fly off the handle at just anything. She’s quiet and reserved, which actually makes for an amazing watchdog. That’s because she doesn’t bark unless she has a reason. When she’s barking, you should probably check it out – unless, of course, she’s playing. She doesn't make a move unless she's sure it's the right one, making her confident in all she does. She loves her family with everything she has, to the point of protecting them from people she doesn't recognize who could potentially pose a threat. She is a great guard dog, but she has a tendency to overdo it on the protection, particularly with other dogs, being a former fighting dog and all. Shar-Peis are not exactly known for their friendliness with other dogs. Though this may be something you can train out of her, you have to do it while she’s still little, or it will be nearly impossible to change her later. The Chinese Shar-Pei hails from the Guangdong province of China. While unconfirmed, experts believe the original Chinese Shar-Pei looked much different from the Shar-Pei we know today. Hunters developed the Shar-Pei to specifically have her loose skin and prickly coat as a way to fend off the wild boar they would hunt. Unfortunately, like Pitbulls, Shar-Peis also spent some time working as fighting dogs. This was because their loose skin made it easier for them to reach around and grab their opponent, even if the opponent had one of the Shar-Pei's rolls in his mouth. While it is true of any dog that the earlier you train them, the better never is this truer than with a Chinese Shar-Pei. This is because if you don’t nip her overprotective ways in the bud while she’s still young, she can grow up to become rather territorial. If you do not socialize your Shar-Pei with other dogs early and often, then she is more likely to be aggressive with them later on. You won’t be able to take her to the dog park, or anywhere else where you might run into another dog for that matter if she is behaves aggressive to people and other dogs or animals. If you are interested in adopting or buying an older Shar-Pei who has not received the proper training to control this, you may want to invest in a sturdy security fence first that will keep her fenced-in and away from other dogs. For help with training your Chinese Shar-Pei dog you should take a look at The Online Dog Trainer by Doggy Dan. Doggy Dan is an expert Dog Trainer based in New Zealand. His online resource contains Hundreds of Excellent Dog Training Videos that will take you step-by-step through the process of developing a healthy, happy well-behaved dog. Like many other breeds, a Shar-Pei hates having her feet touched. This can make trimming her nails rather difficult. Don’t let her win on this one, or she’ll think she can always get out of having her nails trimmed. With puppies, you can actually train them out of this. You have to touch their feet often, either while playing with or grooming them. This should get them used to having their feet touched and can make for fewer problems later. As for brushing your Shar-Pei, a weekly brushing should be sufficient. This goes for both short-haired and slightly longer-haired Shar-Peis. However, if your Shar-Pei is one who suffers from the skin issues that tend to plague the breed, then you may need to create a schedule consisting of weekly baths and daily brushing. Shar-Peis are also prone to ear issues because their ears are small and floppy, which doesn’t allow them to air out. Clean your Shar-Pei's ears regularly to prevent any yeast or bacterial infections from developing. The Chinese Shar-Pei also comes in a host of colors ranging from black to red. You can also find this dog in fawn, cream, sand, and even lilac! The Shar-Pei is especially vulnerable to skin conditions like seborrhea, pyoderma, and mange, though not every Shar-Pei will develop them. 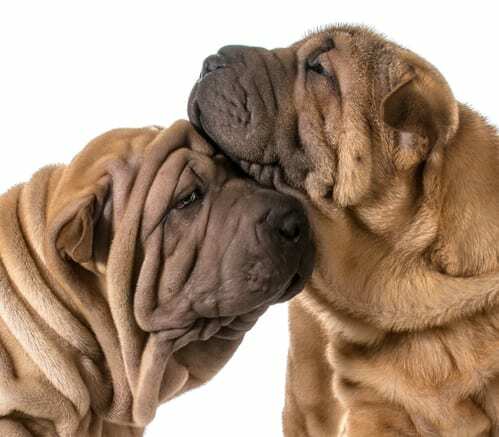 There are a number of additional conditions that can affect a Shar-Pei, so it is important to be aware of them in advance before buying or adopting one of these dogs. In particular, you will need to watch out for something called “Shar-Pei fever,” which affects the dog’s hock joints, making them swell. Some dogs can have an accompanying fever ranging from 103 to 107 degrees, hence the name. 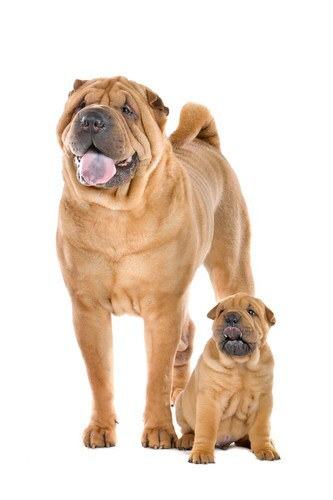 This condition can happen when the dog is an adult, but it more commonly affects Shar-Peis around 18 months old. So long as you seek immediate treatment, Shar-Pei fever typically subsides within 24 to 36 hours. Many Shar-Peis will go through life as incredibly healthy dogs. Their life expectancy is average for a larger dog and ranges from 8 to 12 years old. And, as with all dogs, it is important that you feed your Shar-Pei as recommended by your veterinarian. Obesity is one of those few problems that you have complete control over, so it is important to do everything you can to prevent it. This means being stingy with the treats, too. Maybe one or two for a job well done, but not every time. For reference, a healthy weight for the Chinese Shar-Pei is between 40 and 55 lbs. for a female, and between 55 and 65 lbs. for a male. They're also between 18 and 20 inches tall. Note: Don't let the many issues above scare you. The best way to approach health problems is to prevent them in the first place. The Ultimate Guide to Dog Health is a great place to start. Get a copy to keep at home. It will help you prevent the painful health issues that can plague your lovely Canaan pet from expressing his winning personality and maximizing his life expentancy. If your exercise needs vary, then this is the perfect dog for you because the Shar-Pei is very adaptable. Feel like taking a long walk today, then relaxing it off tomorrow? The Shar-Pei has no problem with this. She is amenable, no matter whether you live in an apartment or a house. Do you have a neighborhood you can walk her around? Great! Do you live in an apartment and so can only take her for some short walks throughout the complex each day? That's fine, too! So long as you can get her out for some fresh air once in a while, she'll be satisfied. It's interesting to see the kinds of combinations a Chinese Shar-Pei can make, what with her squishy body and oh-so-cuddly face. If you would like to add one of these squishy-faced, roly-poly Chinese Shar-Pei puppies to your family, you might be wondering where to start. You can find a Chinese Shar-Pei puppy for sale from a breeder, or you can adopt one from your local rescue or adoption agency. The average Chinese Shar-Pei price can be anywhere from $800 to $2,000. It all depends on the dog's lineage and how much the breeder decides to charge. Adopting a Shar-Pei is always more cost-effective if you're on a budget, with the average adoption price being around $300. However, if you find yourself struggling to afford a dog in the first place, remember that this is just the price to bring the dog home. You'll also have to incur the regular costs associated with feeding her, taking her the vet, and possibly even training and professionally grooming her. If you want to adopt a Chinese Shar-Pei puppy, you may be able to find one through your local animal shelter. Keep in mind, though, that most people do not give up oh-so-cute puppies. The dogs in shelters tend to be older dogs whom their owners can simply no longer care for, through one reason or another. This is also why it is important to keep in mind that you may end up adopting an older dog with behavioral issues. And it is a lot harder to train an older dog than a puppy – sometimes even impossible. You may luck out, though, and get a dog who has already received prior training. Animal shelters will often train their dogs as a way to get them ready for home life. They also do this to minimize the chances that the person adopting the dog will decide to bring her back because of behavioral problems. If you're interested in adopting a Chinese Shar-Pei, you may find the Chinese Shar-Pei Club of America to be a helpful source. Here you can find both breeders and rescue organizations that the official page for the Shar-Pei breed recommends. You must be so careful when buying a dog from a breeder. When you're spending the kind of money that a breeder commands, you need to make sure that the dog you're bringing home is top-quality. How do you do that? Well, your first step is to investigate the breeder on social media. See what present and former customers have to say about the breeder. Once you've selected a breeder, be sure to investigate the premises thoroughly. Make sure the breeder isn't forcing the dogs to live on top of each other, and that the breeder is taking the time to train the dogs. Of course, there will always be some quirks you'll have to train out of the dog when you adopt a puppy. But the earlier the breeder begins to train the dog, the fewer issues you should have. Make sure the dog's living space is safe and clean, and make sure the breeder can produce the proper health certifications before sending you out the door. The last thing you want to do is spend hundreds or even thousands of dollars on a dog – and then even more money at the vet because the dog is constantly sick. The Chinese Shar-Pei temperament makes her a lovable snob. She’ll give you her loyalty and devotion, but she may snub anyone new that enters the home – perhaps even permanently. She’s easy to groom, though you will have to be more vigilant if she suffers from one of the skin conditions known to affect this breed. There are a lot of health issues that a Shar-Pei can succumb to, including her very own “Shar-Pei fever.” (Lucky her.) It is important to be aware of these conditions so that you can take her in for treatment at the first sign of infection. All in, the Shar-Pei is a reserved and loving dog who will guard your home with her life. Just don’t let her get too close to other dogs, as she may instinctually be ready for a fight. She can’t help it – it’s in her blood. Basset Fauve de Bretagne Temperament: Happy, Playful, and Fun!